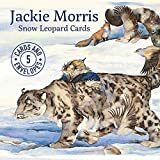 This pack of five beautifully illustrated cards features five of Jackie Morris' magnificent illustrations of snow leopards created for her children's book The Snow Leopard. Each card bears a caption from Jackie on the back and is blank on the inside for your own message. Each pack comes in a hard box that contains five 6.5 x 6.5 inch cards and envelopes.